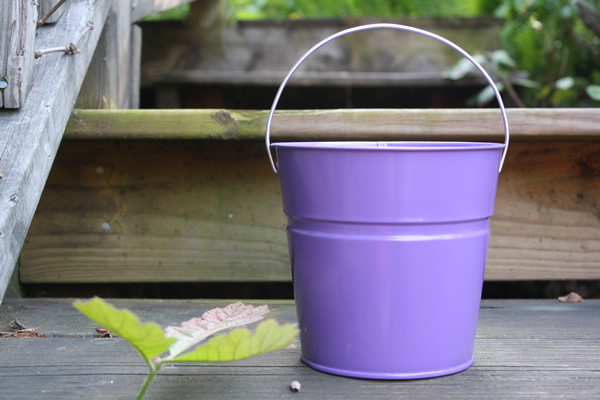 These lightweight, versatile buckets come in a wide variety of colors. Color-code and store craft supplies, small toys, or even a sewing kit. They also make perfect decorations for birthday parties and weddings. Choose your favorite color, add some ribbon and flowers, and create a spectacular centerpiece. We have smaller mini tin buckets in coordinating colors. For larger sizes check out our 5 quart color metal buckets, 10 quart color pails, or 4 gallon large metal tubs in 16 colors. I ordered 4 buckets with lids from you recently. some older ones I have that are so much better. These wires will have to be bent on the inside to make them better. Love them otherwise.